Of course Damon's the ice cream cone. Blur has released a new video for “Ong Ong,” in which it wears insanely silly costumes and invites viewers into a downright adorable ice cream-filled video game world. 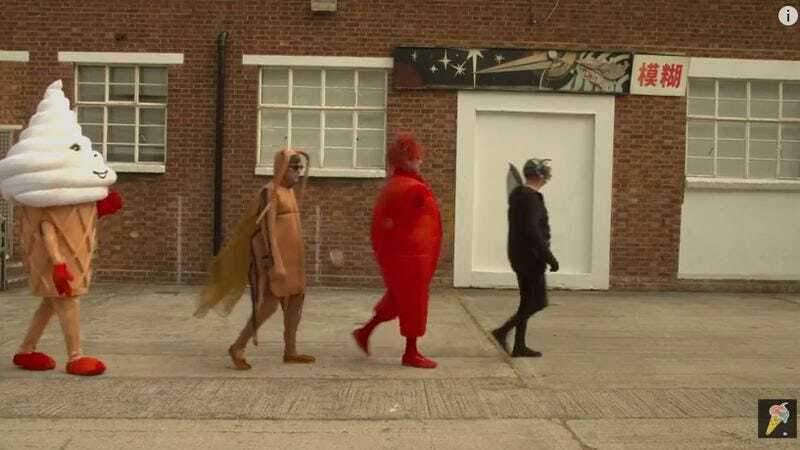 Given that “Ong Ong” is one of the poppiest songs off The Magic Whip, the video makes perfect artistic sense, though how the group convinced Graham Coxon to dress up as a cartoonish cockroach and run around for hours on end is anyone’s guess. And did Alex James really have to keep his arms up perpendicular to the rest of his body for the length of the shoot? That would make him stronger than anyone probably gives him credit for. Watch below and attempt to solve those mysteries for yourself.